Birds prefer eating insects over vegetables and seeds. But if they can't find enough insects, for example, during the mating season, they will turn to vegetables and seeds. Flash/bright light - CDs - not to be used in organic farms because CDs contain heavy metals and may dissolve into the soil. Use foil paper instead. Scarecrow - need to move the position of scarecrow and change clothes regularly because birds are clever. They observe you on the tree and they recognize people. Dry leaves or dry grasses - place on top of the soil after sowing the seeds. If the leaves are not dry, they get rotten and bacteria will grow. Melting of icebergs will reactivate some of the ancient viruses/bacteria. Migrating birds might bring along diseases from the north to the south. Plants grow really rapidly. They look slightly different everyday. I watched them grow from a seed to a young plant. They grew taller and bigger. 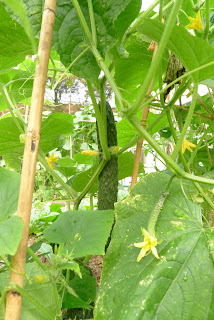 Then they flowered and here comes the cucumbers, expanding in size and ready to be consumed. It took only 40 days. Amazing! 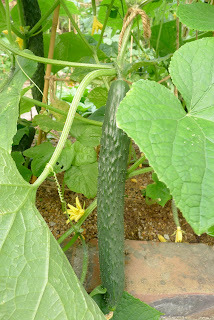 How to tell the cucumber is ready to harvest? 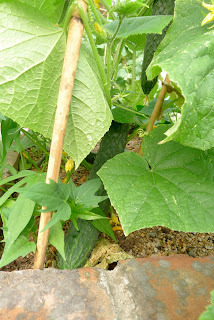 The yellow flower at the end of the cucumber will drop off.